The union of the institutions has fostered careers and significant developments in oceanography and applied ocean science and engineering. This year marks the 50th anniversary of the Massachusetts Institute of Technology and Woods Hole Oceanographic Institution Joint Program in Oceanography/Applied Ocean Science and Engineering (MIT-WHOI JP), which officially occurred on May 8th, but will be celebrated at the end of September. Considered one of the world's most prestigious graduate degree programs in marine science, the Joint Program can trace its roots back to discussions between former MIT President Howard Johnson and WHOI’s fourth director Paul McDonald Fye. As a hub of science and engineering following WWII, MIT’s Department of Geology and Geophysics; Department of Naval Architecture and Marine Engineering; and Department of Meteorology wanted to expand into the exciting field of ocean science, which could be augmented with access to the sea and research vessels. WHOI’s Fye wanted to put more structure into his organization along the lines of an academic institution with fundamental science courses, supporting the next generation of oceanographers. Despite some pushback, WHOI Dean of Graduate Studies H. Burr Steinbach, MIT Provost Jerome Wiesner, and head of MIT’s Geology and Geophysics Department Frank Press, were able to encourage the parties to come to the table in an unprecedented venture that was mutually beneficial for the institutions. 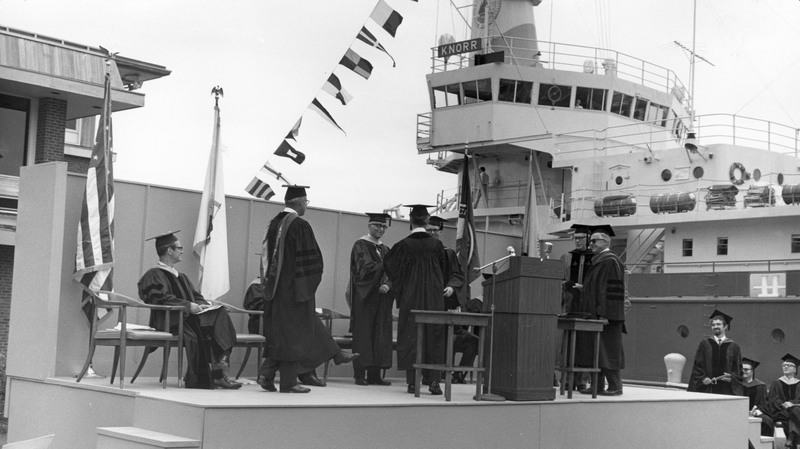 Upon signing the Memorandum of Understanding with MIT aboard the research vessel Chain in 1968, WHOI became a degree-granting program, with the establishment of the MIT-WHOI Joint Ph.D. degree Program. The union allowed for integrated research across ocean sciences: physical oceanography, chemical oceanography, marine geology and geophysics, biological oceanography, and applied ocean sciences and engineering, with a strong emphasis on observational side of oceanography, enhanced by MIT’s acquisition of a small vessel, the R.R. Shrock. MIT departments and programs signed onto the Joint Program at different times beginning with Biology, Chemistry, Geology and Geophysics, and Physical Oceanography followed by the School of Engineering, says Ed Boyle, Director of the MIT-WHOI Joint Program and Professor of Ocean Geochemistry in MIT’s Department of Earth, Atmospheric and Planetary Sciences (EAPS). Boyle, one of the early graduates of the program himself, notes that EAPS has nearly half of its graduate students enrolled in the Joint Program. To ensure the program continues to grow and runs smoothly, Boyle works closely with WHOI’s Vice President for Academic Programs and Dean Margaret Tivey, and as of this past April is joined by MIT Associate Directors Philip Gschwend, the Ford Professor of Civil and Environmental Engineering, and John Leonard, the Samuel C. Collins Professor of Mechanical and Ocean Engineering in the MIT Department of Mechanical Engineering and member of the MIT Computer Science and Artificial Intelligence Laboratory (CSAIL). MIT professors and former Joint Program Directors John Sclater, Arthur Baggeroer, Marcia McNutt, Penny Chisholm, Paola Malanotte-Rizzoli have helped the program to flourish and bring the communities closer together. In its first official year, the program enrolled less than 40 graduate students and since, has boasted more than 1000 alumni/ae including many of the world's leaders in oceanography and climate science, working in research and academic institutions, museums, government, private industry, NGOs, and science journalism. MIT students, professors and alumni/ae used to regularly gather for weekly physical oceanography seminars at WHOI. Now, MIT many members escape the city and make an annual pilgrimage down to the Cape during the summer months for summer courses and socializing during WHOI’s Geophysical Fluid Dynamics Program. The 50th anniversary celebration will be held September 27th and 28th, 2018 -- at MIT and at WHOI on the second day, during which time, attendees will discuss and hear about the MIT-WHOI Joint Program’s contribution to the world of oceanography and science now and in the future. Jaime Austin has generously offered funding to support the 50th Anniversary event. Event registration closes September 19, 2018 at 11:59PM EDT.